Another holiday season has come and gone and we’re enjoying the start of a brand-new year. For many, it’s an annual tradition to resolve to eat healthier and exercise more (especially after the holiday indulgences! ), save more money or learn a new skill. 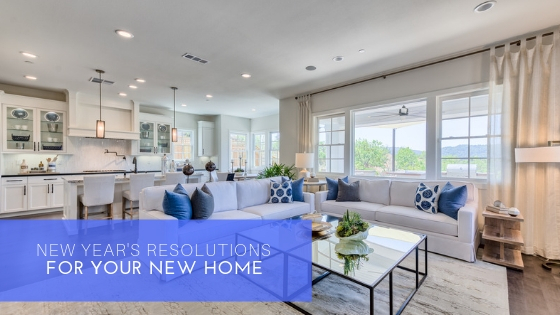 While you’re making plans for a new year, have you considered creating resolutions for your home? Here are our top picks for some new year resolutions for your home. You don’t have to wait for spring to organize your home. The beginning of the year is a great time to streamline your possessions, especially if you’ve received new items as gifts. You don’t have to rush to clear out all the things at once; you’ll wear yourself out before you clear everything. Instead, go room-by-room. This process does take longer but you won’t become discouraged. Keeping your home clean can be a struggle and no one wants to spend their entire Saturday cleaning! Instead, break down cleaning tasks on a daily, weekly, and monthly basis to keep your chore list manageable. This is the gift that keeps on giving: not only will you be helping to improve the planet, you’ll also reduce your monthly energy bills! You don’t have to install solar panels or rainwater barrels to make a difference. You can make a difference by simply turning off the lights in unoccupied rooms, installing LED lightbulbs and low-flow showerheads, turning off your air conditioner while you’re away from home and turning down the thermostat overnight (a smart thermostat makes this simple!). If your resolution is to spend more time with family and friends, why not make your home more inviting for entertaining? Thankfully you don’t need to launch into an expensive and time-consuming renovation. Instead, assess your main entertaining space for ways to make it more welcoming: adding additional lights, rearranging the furniture to spur conversation, freshen the décor, or even update the guest bedroom. Think about the parties you’ve hosted last year; is there anything you wished you had to improve your guests’ experience (like more tables or chairs)? If so, its time to get them. If you plan on selling your home this year, it’s time to start preparing your home now! Even before you begin reaching out to real estate agents, make a list of tasks to accomplish. Here are some helpful tips to get your house into prime selling condition. You spend a lot of time at home, so why not make it the best place? Take some time to plan out how you want your home to be this year.